We are standing up to the fossil fuel industry to stop all new coal, oil and gas projects and build clean energy for all. The movement needs more people like you. Can you share this with your friends? It’s simple — to keep global warming below 1.5°C, coal, oil + gas needs to stay in the ground. Sign up for an inside look into the #FossilFree movement. Stories, news, and videos, delivered to you every 2 weeks. April 29th. Washington, DC. Hundreds of thousands stood up for climate justice and a clean energy future. Follow 350 on social media to stay up-to-date with the latest news from the climate movement. The successful fight to save the Hambach forest in the heart of Germany’s lignite mining region is an important victory in the face of the enormous challenge of limiting global warming to 1.5°C. The People’s Dossier on 1.5°C contains the stories of communities fighting against fossil fuel projects and for a fast and just transition to 100% renewable energy. It outlines how climate change is currently impacting them and grounds their fight in the latest climate science. As the Mediterranean is already struggling with droughts and wildfires, Europe fuels the climate crisis with new gas mega-pipelines. A local community protecting its century-old olive groves is fighting back. ► Help 350.org build a powerful climate movement. We believe in a safe climate and a better future — a just, prosperous, and equitable world built with the power of ordinary people. 350 is building a global grassroots climate movement that can hold our leaders accountable to the realities of science and the principles of justice. Keep carbon in the ground. Help build a new, more equitable low-carbon economy. Pressure governments into limiting emissions. Welcome to 350 South Florida! We are your local network for grassroots activism on climate change issues. We act locally. “350 South Florida” is affiliated with 350.org, a non-profit that is building a global movement to solve the climate crisis. Growing stronger daily, the 350 family is active in 188 countries. This movement thinks and acts globally. Why the name “350?” Numbers are universal, and “350” refers to what scientists consider a safe level of carbon dioxide in the atmosphere (last seen in 1988). 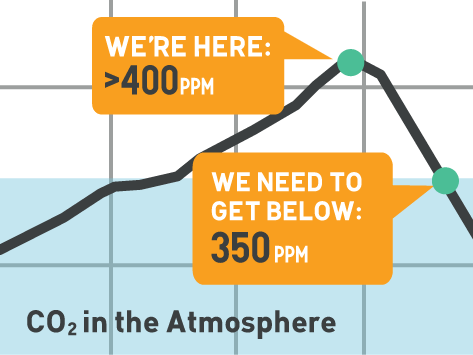 In 2013, the global CO2 level surpassed 400 ppm (parts per million) for the first time in human history. We are engaged in the fight of the century. 350 South Florida is firmly committed to non-violent social change. Membership is open to all, and it implies a commitment to non-violence and the acceptance of the equality of all other members. Actions will be announced as they develop. We invite you today to join the online conversation on our Facebook. This past year we have seen a wave of attacks on the environmental and social justice movement. Save the date for our Fall Kick-off Volunteer Orientation & General Meeting on Sunday, October 28! We’ll have delicious vegan food, hear campaign updates and announcements, learn about climate justice fight in South Florida. We’ll also talk about how you can join the fight for an immediate and just transition away from fossil fuels to a sustainable economy based on 100% renewable energy! Get climate movement updates from 350 South Florida & 350.org! Thanks! You should get an email confirming that you have signed up.